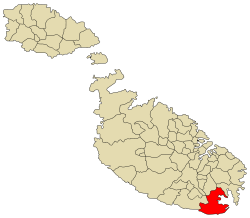 Birżebbuġa (or BʼBuġa) is a seaside town in the Southern Region of Malta, close to Marsaxlokk. It is approximately 8 miles (13 kilometres) from the City of Valletta. It has a population of 9,977 as of March 2013. Popular among Maltese holiday-makers for decades, this village is perhaps best known for its important archaeological sites, especially Għar Dalam and Borġ in-Nadur, and a sandy beach commonly known as "Pretty Bay". The village name "Birżebbuġa", from the Maltese, means a "well of olives". Such linguistic evidence established early inhabitants were in the south of the island since the first millennium. The name also indicates climate and food. Near the village of Birżebbuġa is Għar Dalam, meaning a dark cave. Għar Dalam Cave is a highly important site, as it was here that the earliest evidence of human presence on Malta was discovered. Artifacts date back to the Neolithic Period some 7,400 years ago. The display area consists of two parts: the cave and the museum, which exhibits a remarkable wealth of finds from animal bones to human artifacts. An overlaying river running at right angles formed the cave. It is some 144 metres deep, but only the first fifty metres are open to visitors. The lowermost layers, more than 500,000 years old, contain the fossil bones of dwarf elephants, hippopotami, micro-mammals and birds. Above the pebble layer is the so-called �deer� layer, dated to around 18,000 years ago. The top layer dates to less than 10,000 years and holds evidence of the first humans on the Island. Experts hold that these remains suggest that the Islands were once a land bridge to continental Europe. Other remains include those of a prehistoric temple or settlement, Borġ in-Nadur, which dates from the Bronze Age. The settlement was fortified with a large stone wall, still visible today. These temple ruins are important because they reveal not only a four-apse temple (c.2000 BC), but an authentic, fortified Bronze Age domestic settlement. The remains of a large, defensive wall lie nearby, running across the head of a promontory between two valleys leading down to two bays. The wall was built facing inland. The village would have had the sea to its back. This logistic situation leads scholars to believe that the people living in the village were more afraid of being attacked by invaders by land rather than from the sea.